AleaSoft, April 9, 2019. 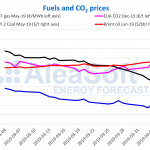 AleaSoft analyses the impact of the new Royal Decree on electricity self‑consumption to help make the renewable energies an important factor in economic and social change in Spain at the mid-term. On Friday, April 5, the Royal Decree that regulates the electricity self-consumption from the administrative, technical and economic point of view was approved. Collective self-consumption is enabled, which can benefit neighbourhood communities and, very importantly, industrial estates. The procedures to be carried out by the self-consumers when an installation is registered are simplified and a simplified mechanism for remuneration of the electricity produced and fed into the grid is established. The new Royal Decree regulates in general a set of mechanisms for a new activity that is the result of the massive introduction of photovoltaic energy. Some of these regulations did not exist and others were not satisfactory to empower self-consumption activity. It should be noted that the UNEF, the Spanish Photovoltaic Union, has an outstanding role in this achievement, which with an awareness-raising task influenced all the decision areas of the Spanish policy to first repeal the “sun tax” and now for this new Royal Decree to collect the main priorities of photovoltaic self-consumption. 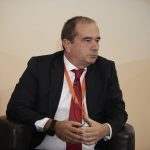 As we have stated in previous publications, renewable energies and especially photovoltaic energy represent an opportunity for southern European regions to compensate for economic inequalities with respect to the northern regions. The fall in the prices of photovoltaic technology means that domestic and industrial self-consumption installations are becoming more affordable, which now can be done collectively with this new Royal Decree. The high prices of electricity that we are having since 2018 have a negative effect, especially for the industries that have a large electricity consumption. Through individual or collective self-consumption these prices can be reduced. In addition, self-consumption can bring new income if the surplus is fed into the grid and this is an opportunity for many companies. Another important aspect of the incentives for self-consumption is to replace energy imports. Every year the Spanish electricity sector imports electricity, gas, coal, diesel and nuclear fuel. The annual cost is tens of billions of euros that leave the country. With each MWh that we can self-produce, we will be reducing the imports electricity bill. In the future, our vision is for Spain to become a net exporter of renewable energy. In addition, with each MWh that we can self-produce we will be helping to decarbonise the electrical system and to reduce CO2 emissions and other polluting gases. The new parliament to come out in the next elections, the new government and in general all the political groups must draw up a long-term incentive and development plan for renewable energies. The implementation of renewable energies are a fundamental part of the future development of Spain, especially in the southern regions of the country where there are more hours of sunshine and solar energy production, mainly photovoltaic, is more productive. The recently published Integrated National Energy and Climate Plan (NECP) proposes a very important growth in renewable energy capacity, and highlights solar energy with the installation of more than 37 GW throughout the national territory, representing a growth of 530% compared, for example, with the 114% expected for the wind energy. From these 37 GW solar of the NECP, 32 GW correspond to the photovoltaic energy and 5 GW to the solar thermal energy. 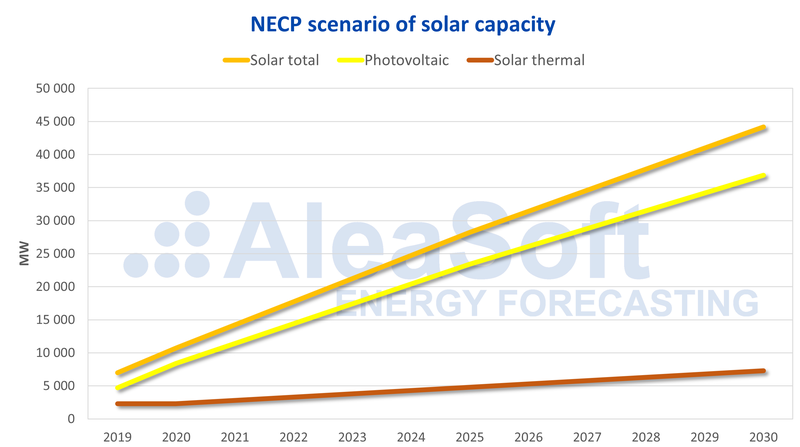 Source: Prepared by AleaSoft with data from the Integrated National Energy and Climate Plan. More PPAs (Power Purchase Agreements) are being signed to install hundreds of new megawatts in the country. For the next ten years, investments worth 30 billion euros are expected in the renewable sector. With each PPA, investments in renewable energies are guaranteed and consumers obtain stable prices in the future, as well as a 100% renewable electricity supply guarantee. These investments must be channelled to the most disadvantaged regions so that they have new incomes and for the creation of jobs. The new sources of clean energy should be a basis for creating new industries, training centres and research centres. With every MWh that we can self-produce or produce with renewable energies we will be helping to create jobs, knowledge and wealth for the most disadvantaged regions and in general for the whole country.